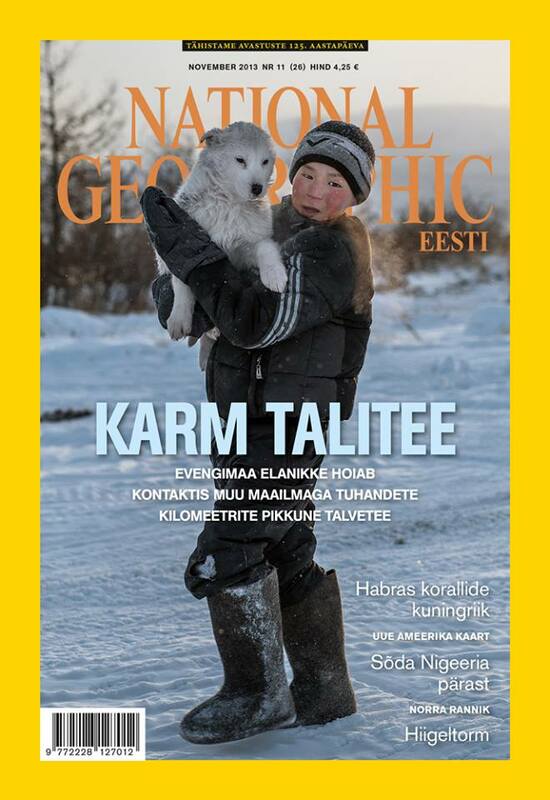 Berta Tilmantaitė’s story on the Winter Road in Russia has been widely published, including on the cover of the Latvian, Lithuanian and Estonian NatGeo magazines. It also featured in the Geographical magazine (UK) and Rhythms Monthly in Taiwan. The cover picture is picture of a local boy named Spiridon, who is deaf. He spends a lot of time with dogs, playing around, as he doesn’t attend school. “Zimnik” – the winter road – only operates during the coldest months of the year, because it is a road of perpetual ice and frost. The word “zimnik“ originates from the Russian word “zima” meaning “winter.” Located in Russia’s Evenkiysky District in the Krasnoyarsk Territory, it lies along the polar circle in Russia, Siberia. The region is 767,660 km2 (~1.5 France). It is one of the sparsest inhabited land surfaces of the planet. The majority of the region’s fuel supply reaches the region by the “zimnik,” which vanishes in the summer months. Berta traveled there for two months to documenting life on this road, with average temperature while filming around -40°C.